I am wearing the costume. I didn't know what to be for halloween, and my friend had an old Halloween decoration from the 70's with a skeleton dancing with a top hat and cane. She said, "Why don't you dress up like that." I took her joke seriously, and decided that was going to be my costume. I bought the black leggings and tank top, and then cut every bone and rib out by hand and ironed them onto the outfit piece by piece. It took me 7 hours, non stop! I purchased a cane and top hat, and had the wig from another costume. I painted bones on my arms, my chest, had my friend do my back, and then topped it off with painting my face up myself. 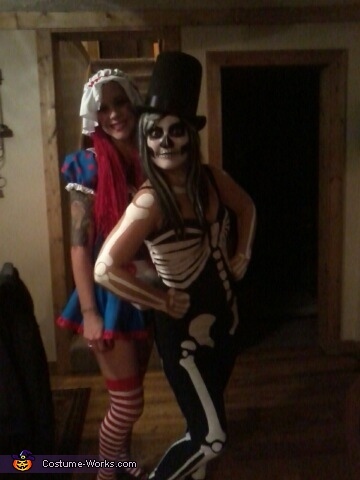 The picture with the red wig was a joke about how scary my costume was and how I didn't look like myself at all. It was a homemade raggedy Ann wig I made for my friends costume!